PE1 is leaking a route into the cust1 VRF for the customer 2 host (10.0.2.1/32) via a next hop in it's Global Routing Table, that points to PE2's GRT loopback0 address. PE2 is leaking a route into the cust2 VRF that routes to the customer 1 host (10.0.1.1/32) via a next hop in it's GRT, that points to PE1's GRT loopback0. For the return routes, PE1 has a route in it's GRT that points to the customer 1 host (10.0.1.1/32) via the interface the customer 1 host is connected to (fa0/0, because that interface is inside the VRF cust1). 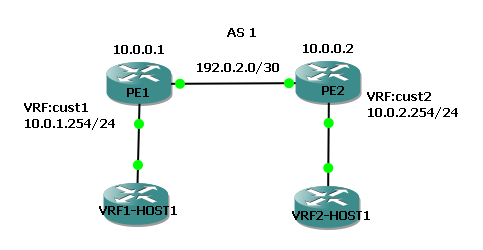 Vice verse, PE2 has a route in it's GRT that points to the customer 2 host (10.0.2.1/32) via the interface the customer 2 host is connected to (fa0/0, because the interface is inside the VRF cust2).